Hiring a house cleaner is not outrageously expensive, nor is it just for the wealthy like it is usually depicted in the media. However, if you are on a budget sometimes the usual routine needs to be changed in order to fit your comfortable price range. 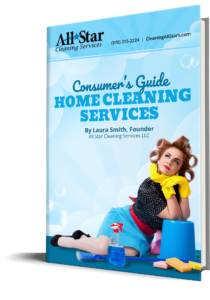 Here are our best suggestions for reducing your cost of housecleaning services! Leave off the kids rooms. Whether it be by a chore chart or a quick “ten-minute” pick up rule, it is one room that can usually be maintained by your child without outside help. Explain to your child/teen that only he/she knows where everything goes and keeping a clean personal space is an important skill to learn. Apply the “10 minute pick up” rule before the cleaners arrive! Tidy up! set the time and get your house scrambling! Take 1-2 minutes to go from room to room and pick up all personal belongings and put them back where they belong (most likely your house cleaner will not know where you like to keep your games, bills or other personal out of place items) In doing so creates the opportunity for your cleaners to focus on the more thorough cleaning (aka the stuff that makes us want to hire a cleaner: floors, walls, dust, grime etc.). Less time picking up before scrubbing=less money spent. Request less-used rooms be cleaned “on request” only. Depending on the size of your house and how many occupy it, there are sometimes rooms that are less used than others (craft room, guest bedrooms, guest bathrooms) and do not necessarily need to be cleaned each time. Usually with a little notice these areas can be added on request. Leave off the basement. If you haven’t already, leave the basement off the check list unless it is used often (assuming it is a finished furnished basement and not a cold cement one). Once or twice a year have a full clean to dust out any spider webs and clean window sills. Avoid the Add-on offers. Your cleaning service may also want to do your dishes, laundry and linens–at typically pricey add on charge, increasing the final cost noticeably. It sure seems like a dream to come home to a clean house, clean dishes, and folded laundry on the foot of your bed and I can relate completely… but it is a lot cheaper to just fit it in to your daily routine. And lastly, the ultimate money saver: Have your cleaners come less often. Shortening your cleaning service from weekly house cleaning to bi-weekly or once a month doesn’t set your house up for disaster, it will still be cleaned but you must take the responsibility to maintain your house in between cleans. That may include adding bathrooms (scrubbing tubs/showers/toilets) and kitchen (sanitizing counters/appliances) to your weekly chore chart. Combining a few or all of these options above will help reduce your service bill while still keeping a clean home! If you do not have a cleaning service and are considering please browse our website and see what our wonderful team has to offer! We guarantee our services and know you will be confident with our All Stars in your home!